Blacketts Retreat give you long-lasting results by using natural, holistic therapies that improve skin texture, strengthen muscles, and give the skin a fresher, more youthful appearance. We will analyze your skin and provide you with customized skin care appropriate to your particular skin type. Janine will taylor a treatment plan specific to the special needs of your skin, whether it be acne, dry skin, broken capillaries, sagging facial muscles, smile lines, 'crows' feet, forehead lines or neck lines. Even if your skin is in good condition, you need deep facial cleanings to maintain your skin in optimum health, and to cleanse it from the damaging effects of pollution, make-up and excess accumulation from the oil glands. The younger you are when you begin a program of regular Professional facials, the younger you always will look. In addition, our skin treatments will be a pleasant, relaxing experience for you, especially after a stressful day at work. Janine's in-depth consultation will include nutritional advice that is essential to good skin care. Includes cleanse, analysis, deep cleanse, exfoliation, masque and relaxing massage. Choose between Eve Taylor Aromatherapy facial skin products or salon services products. As above but without face masque. Includes cleanse, analysis, exfoliation, moisturise and mini massage. *As we are all individual, your therapist will select the products specific for your skin type and for your well being. The perfect blend of energising or relaxing oils to revitalise and nourish the skin. Relax as the essential oils and their wonderful aromas work their magic. Using natural ingredients and pressure point massage techniques, these nourishing facials are customised to meet your skin's individual needs. 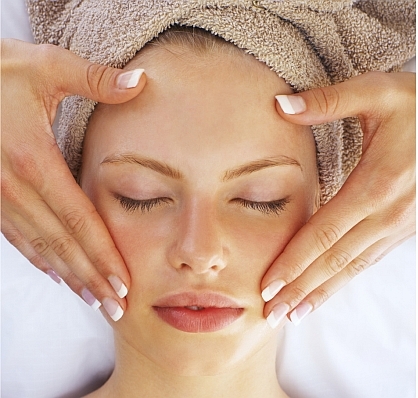 Facials aim to purify, refine, and hydrate your skin, restoring its natural beauty. Circulation is improved and toxins are eliminated from the skin. For further details about Facials Contact Us.